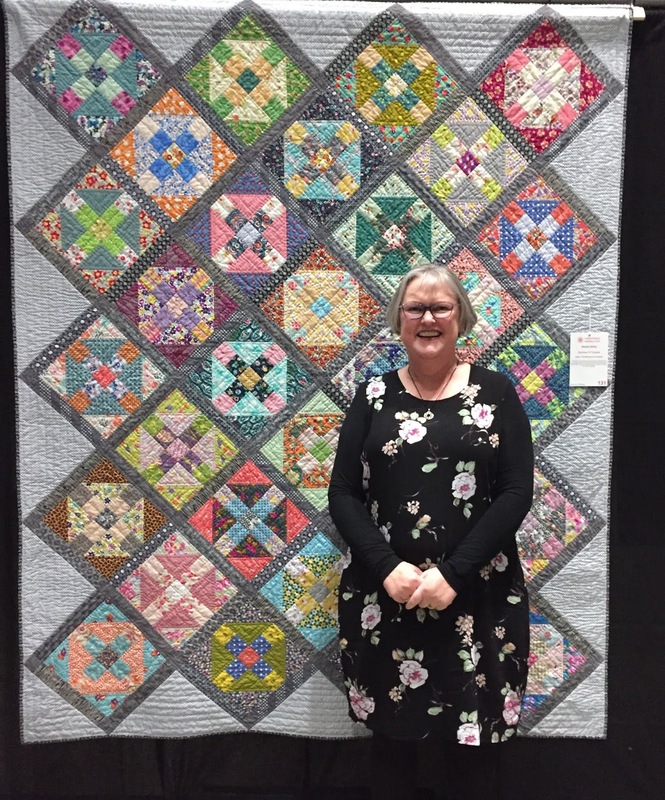 I'm thrilled to share my most recent finish, Summer in Torquay, and to let you know that it received a Merit award in the Churn it Up challenge at Capital Quilters exhibition. It seems I won a few awards at our show! More details to come next week. I started this Jen Kingwell design back in January because I wanted to enter our guild's Churn it Up challenge which is part of our exhibition. The challenge was to include at least one Churn Dash block in a quilt. I don't especially love the Churn Dash block, but I stumbled across this Flea Market Dash pattern in my Quilt Lovely book by Jen Kingwell, and I liked that it contained Churn Dashes, but they weren't too obvious. For most of 2017 I belonged to a stash building club at Amitie Textiles (Jen Kingwell's shop). They sent fat 16ths to members every six weeks or so. I ended up with a lot of fat 16ths, but I wasn't sure what to do with them. This Flea Market Dash pattern seemed the ideal opportunity to use a lot of the gorgeous fabrics I had collected. I've called this quilt Summer in Torquay, because it does look summery, and Torquay, Australia is where Amitie Textiles is based now. I was lucky enough to visit the shop twice in January (summer in Australia). One of those days got to 42C (107F) so I won't forget that day in a hurry. The batting is Quilters' Dream - Cotton Request, as recommeded by Jen Kingwell. It's nice thin batting for a summer weight quilt, but I think I still prefer wool for the loft. The backing is voile and I'm not sure I'd use that again either. It has more stretch in it than cotton, and didn't work so well with basting on a long arm. Time seemed to get away from me on this quilt, so I had to take it on my recent holiday to Auckland, and I even had to quilt a few blocks in the hotel in Taupo on the way back! I hand quilted with Aurifil 28wt in a variety of colours inside the blocks, and used Aurifil 12wt on the shashing and filler triangles. I'm very happy with the result, and thrilled to see it hanging in the exhibition. hOW DO YOU HAVE THE LONG ARMER BASTE IT? lARGE MEADER, STRAIGHT LINES, LARGE STITCHES? i AM HAVING TROUBLE BECAUSE IT SHIFTS SO MUCH when I hand quilt. Please give me some pointers. Combining color with grays is one of my absolute favorites! I will have to check out that Jen Kingwell pattern. I am just now delving into combining different blocks that contain like fabrics. My block to make today using yellow and orange fabrics - a layer cake. Such a lovely quilt. I admire the way you manage to make use of the fabric you collect. It doesn't seem to simmer long in the stash. Hand quilting always makes a quilt look lovelier and you do a wonderful job. Congratulations on your ribbon(s). Looking forward to hearing more about those. I love your use of the dark greys as sashings. They really frame the blocks. Nicer even than Jen Kingwell’s quilt. One of the ribbons is for hand piecing, so presumably that’s how you’ve made it. Not EPP? Gorgeous quilt, however it was sewn! Another beauty! Your quilts are so unique and I love them...seems you have more than 24 hours in a day though...don't know how you do it! I love this quilt. The colours you've used make it speak to me. I'm very inspired to maybe make this one from my copy of Jen's book using my DS fabrics - I have a lot of them. did your monthly collection from Amitie include liberty as well as normal quilting cottons? My goodness, not one ribbon, but four! Many congratulations indeed.